It may not be as immensely popular as its sister festival, Sundance, but the Slamdance Film Festival – held in Utah every year at the same time as Sundance – prides itself on being more faithful to the independent spirit of filmmaking. Both fests kick off today, and for Slamdance, it’s sure to be a special year, considering the 2009 event hosted the premier of Paranormal Activity, which got acquired by Dreamworks, then passed on to Paramount, where it went on to become a box office smash later in the year. 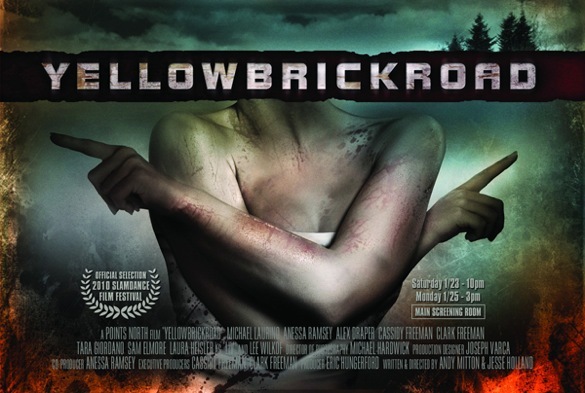 No doubt hoping to follow a similar path as Paranormal Activity this year is a creepy little locally-made film called Yellow Brick Road. Shot entirely on location in New Hampshire and premiering at Slamdance this week, Yellow Brick Road follows a group of people in the present day intent on finding out what happened to the population of Friar, New Hampshire in 1940 when the entire town walked up a winding mountain trail and disappeared. Judging from the trailer, this is going to be a good film, especially considering its the feature debut for directors Jesse Holland and Andy Mitton, who both went to Middlebury College in Vermont. Among the cast is Anessa Ramsey, who starred in the Mill City Mayhem horror feature The Signal. Watch the trailer below, and keep your fingers crossed that this one makes it to theaters later in the year. This entry was posted in Lowell Screenings and Events and tagged mill city mayhem, Paranormal Activity, Slamdance, Sundance, The Signal, Yellow Brick Road. Bookmark the permalink.